The Scraggly Cats are a fantastic fusion of Ceilidh pop rock. Rocking funky ceilidh music and pop anthems along with classic Scottish songs. 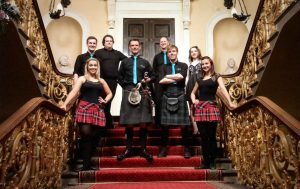 The band plays with real passion and will inject your event with ceilidh energy. By popular demand the Scraggly Cats were formed to include a female singer alongside the Reel Time Ceilidh Band. Allowing them to cover a range of pop, rock, soul and Scottish songs and combine it with their distinctive contemporary ceilidh sound. The Ceilidh pop rock band is usually a 5 piece with: singer, keys, guitar, kit of drums and pipes. A bass player is brought in as the 6th player to open up the set list to a wider range of pop. Have a look at the set lists below for more information on the tunes. The Scraggly Cats play at weddings throughout the year at luxurious hotels and historic venues. The band regularly entertain corporate clients at venues such as Stirling Castle, The Assembly Rooms and the National Museum of Scotland. Conference ceilidh events at EICC, SEC, Hilton Glasgow and Merchant Square. The band are great at explaining to an international delegation how to ceilidh dance. The crossover between the ceilidh and covers is also a safe bet for conference event planners. The band works with Scottish highland dancers to help manage large ceilidh groups. They can also provide ceilidh demonstrations, or partner guests in group ceilidh dances. If you are looking for a high energy Ceilidh and Covers band. To treat guests to Scottish culture, at the same time as party floor fillers. Then book the Scraggly Cats! Book your Ceilidh and Pop Band today – get in touch!